Online Anonymous Fraud Reporting Form: Click here to email a complaint or to report fraud anonymously via our web form. 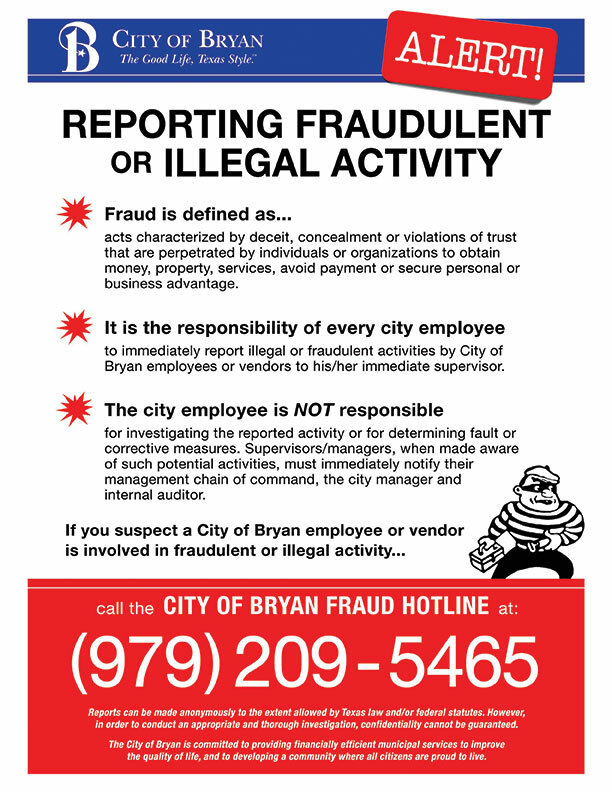 The City Internal Auditor’s Office is responsible for ensuring that proper accountability is maintained over public funds and helping to improve the efficiency and effectiveness of the City of Bryan. To accomplish this, the City Internal Auditor performs audits to help ensure the reliability and integrity of financial records, compliance with City policy and procedures, accountability and protection of City assets, and the achievement of program results. The Office of the City Internal Auditor was created in 2006 by a City Charter amendment election. The City Internal Auditor’s Office reports to the City Council through the Audit Committee. The City Auditor has the authority and responsibility to assist the City in achieving full accountability throughout all City activities. The City Internal Auditor’s office is located on the third floor of the Municipal Office Building in Suite 307. The preliminary survey is to determine whether an area will require a detailed examination. The field work is to review and evaluate operations and results. Reporting is to compile and report any findings and recommendations in a final audit report. The report is distributed to the Audit Committee, the audited, and any other appropriate City personnel. The follow-up is to determine if any recommended corrective action has taken place.